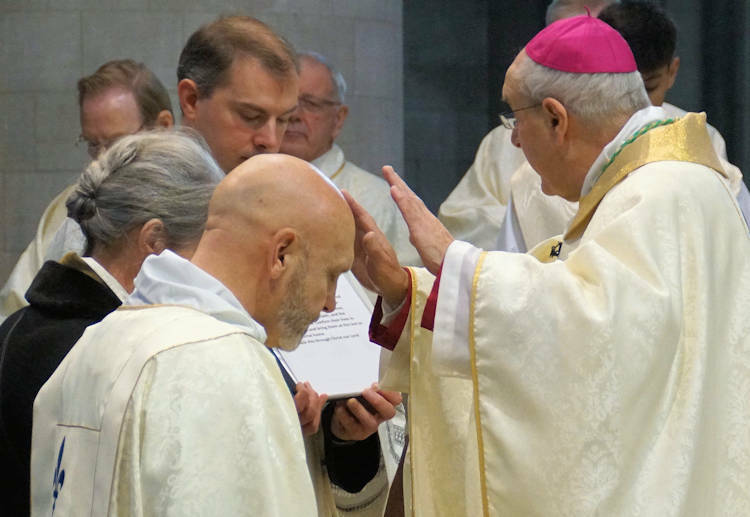 Australian former Anglican vicar, Dcn Sam Randall, was ordained to the Catholic priesthood by Bishop Alan Hopes at the Cathedral of St John the Baptist in Norwich on Friday March 15. In his homily, Bishop Alan said: “Samuel, you responded to God’s invitation many years go. You said ‘Yes’ to God. “Now in recent years you have said ‘Yes’ again to another invitation – to come into full communion with the Catholic Church. Last year you were ordained a deacon. Today you receive the grace of the priesthood in the Catholic Church. “As a priest you will be a source of God’s blessing as you reconcile God’s people in the sacrament of forgiveness, as you anoint them in their sickness, as you baptise, catechise and walk with them in times of joy and sorrow and death. “In your ministry may you always be ready to do what God tells you. May you, like Mary at the cross, remain faithful to the Word of God and give yourself completely to Him and His service,” said Bishop Alan. Fr Sam met his Swiss wife Mirjam at Bible College in England and both went to Cambridge where Fr Sam did more studies and went forward for Anglican ordination, attending Ridley Hall for three years. He served a curacy in Hull, completed post-graduate studies in Leeds and during this time in England, the couple had three children. Fr Sam then joined the Army as a Chaplain, which included a period of active service during the First Gulf War. A post in Leeds as a Team-Vicar and as the director of a youth development charity was followed by a move to the West Indies as missionaries. Fr Sam was then appointed as the diocesan ecumenical officer for Durham and the parish priest of an ex-mining community. After five years he was appointed to be the Bishop’s Officer for Church in the World for Bradford. Fr Sam said: “We then ‘discovered’ Lighthouse Catholic Media and the Augustine Institute and met regularly with Fr Aidan Nichols exploring together the Catechism. 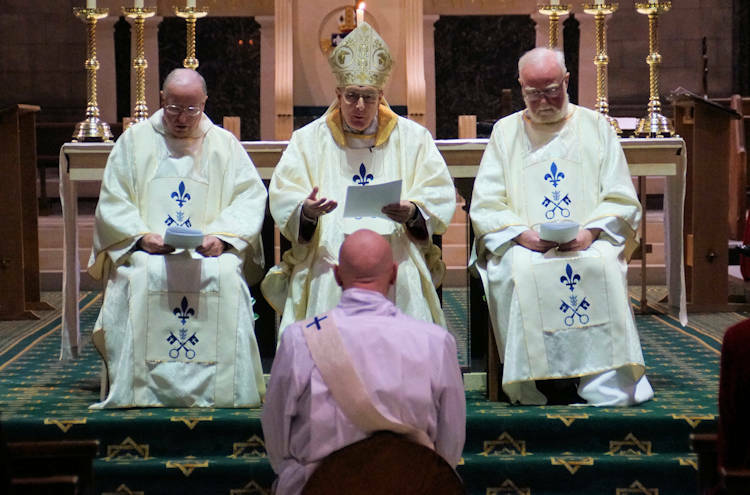 Pictured above is Dcn Sam Randall, being ordained by Bishop Alan Hopes at St John’s Cathedral. Pictures by Keith Morris.